Starbucks, always game to toss out seasonal drink concoctions, has debuted its Summer offerings, which feature familiar faces alongside a new sugar rush. 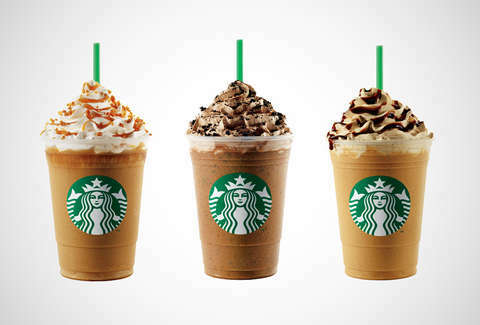 The returning champs include the Caramel Ribbon Crunch Frappuccino, a caramel sauce, caramel drizzle, and crunchy caramel sugar concoction, and the Mocha Cookie Crumble Frappuccino with mocha sauce, vanilla syrup, frap chips, chocolate whipped cream, and cookie crumble. The newcomer, the Caffe Espresso Frappucino, slightly tones down the sugar to reach more serious coffee fans who want some espresso-infused whipped cream and Italian roast drizzle in their frozen java. The drinks are pegged to Starbucks' "Frappuccino Happy Hour", which runs through May 10, where the frozen drinks are half-price from 3-5pm. Get ready to stand in line with these guys. Kristin Hunt is a food/drink staff writer for Thrillist and would really like to know if this espresso-infused whipped cream comes in a can. For a friend. Follow her at @kristin_hunt.